This unique evening event gets you up close and personal with our exciting variety of owls, swooping and gliding over your head or landing on your gloved fist. 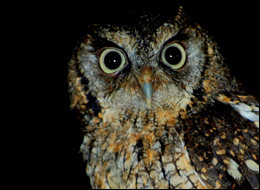 Our new Twilight Zone will give you a completely different encounter, as you experience owls flying past you in the dark. You will also get a glimpse of our centre ‘after hours’ when a lot of our owls prefer to come out and about! During the experience you will receive lots of information about the owls and be able to ask as many questions as you like, giving you a real insight into the world of these stylish hunters. This is a two hour indoor/outdoor experience, running from 6pm – 8pm, available on the specific dates listed. For larger group numbers please contact us directly. Once a voucher has been purchased please call us on 01884 277297 to book your preferred date.